"Battle: Los Angeles" isn't an alien invasion film, it's a military picture with the occasional alien appearance. The marketing trumpets a global perspective on trespassing extraterrestrials, but the picture actually takes place almost entirely in Santa Monica, boiling down a sense of massive widescreen scope to a few city miles, placing the audience into the driver's seat as a besieged platoon attempts to defend themselves against an unknown enemy. "Independence Day" this picture is most certainly not. Aliens have attacked Earth, leaving the locals stunned and shaken as vicious armies rise from the oceans to begin their extermination of human life. 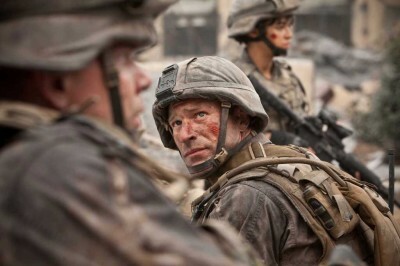 On the ground, a team of Marines has been assembled to help evacuate Santa Monica before it's blasted into oblivion to halt advancing alien activity, with Staff Sergeant Michael Nantz (Aaron Eckhart) called back into duty after a troubling history in Afghanistan. Storming the city, the platoon encounters numerous alien warriors and ships armed with immense firepower and technical superiority. Struggling to survive, the team comes across a few frightened civilians (including Bridget Moynahan and Michael Pena) they must protect, finding the road to rescue blocked by a relentless enemy that's difficult to kill. 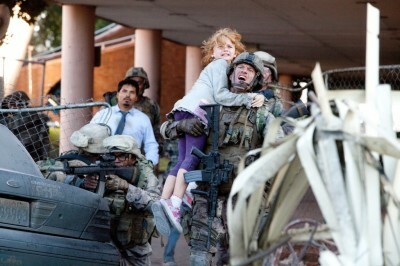 The concept behind "Battle: Los Angeles" is to take a sci-fi premise and shape it into modern militaristic mayhem, with director Jonathan Liebesman ("Darkness Falls," "Texas Chainsaw Massacre: The Beginning") deploying ceaseless amount of shaky-cam stylistics to pound the viewer over the head with an impression of front line realism. It's a concentrated effort to turn the movie into sensory overload, excitedly mimicking brutal Iraq War videos viewed on the news and internet. It's a tricky concept, and one that's not especially novel, but Liebesman is committed to the cause. He wants you to feel trapped in the middle of the action. He wants you to feel the heat of combat on your cheeks. Apparently, he also wants you to barf up your popcorn, with a quaking camera aesthetic that's intolerable to endure at times, with every last twitch of movement covered by a swaying frame. "Battle: Los Angeles" is a lot of noise covering for very minimal substance. There's a script credited to Christopher Bertolini, but I don't exactly understand what he's responsible for. The dialogue and plot highlight a hornet's nest of clichés, pulled from every last war film, spending the opening 15 minutes of the feature developing faceless characters of no discernable personality before the carnage begins. Only Nantz is handed an arc to explore, but it's a hoary beast concerning a broken leader rekindling his inner fight, rising to lead his boys to victory. The rest of the platoon is filled with unknown actors counted on to continually scream and grunt, waiting for their eventual death at the hands of a special effect. 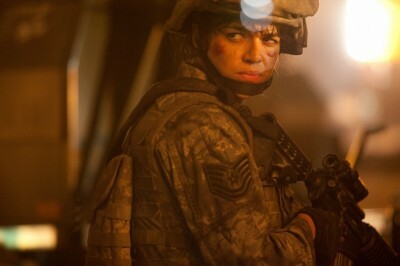 Instead of intensely investing in the Marines and their individual quirks (think "Aliens"), Liebesman plays the group as nondescript as possible, hunting for sobering realism while sacrificing engaging cinema along the way. The same emptiness carries over to the enemy. The invaders from outer space are never revealed in full, reduced here to a squishy suit of organs and bio-weapons, viewed primarily in the distance to save on visual effect fees. There's no defining moment where the Marines examine alien details, allowing the viewer a full appreciation of the growing threat. The baddies are an unexplained menace, with a true operational dissection likely saved for the sequels. They have laser guns and space ships, and they excel at reducing Los Angeles to rubble. However, the film never feels like war. It feels like a pedestrian video game. There's no cinematic spirit or personality to delight in, with the picture one mindless display of scurrying and screaming after another. The effect is more numbing than rousing. "Battle: Los Angeles" finally hits a more blockbuster tone in the final act, where the squad takes on an enormous alien control ship using all of their resources and military instinct. It's a case of too little too late, breezing past a substantial threat (or final boss level) to madly dash toward the anti-ending, where the story intends to carry on into numerous sequels, maybe exploring skirmishes in additional Los Angeles suburbs, I don't know. Perhaps if more concentration was put into building an engrossing, impassioned first installment, this allegedly global invasion would be an event worthy of a franchise. Instead, "Battle: Los Angeles" is a tiresome fireworks display starring a cast of cardboard cutouts, quick to make a visceral fuss but frustratingly negligent when it comes to providing a reason to care. Buy tickets to "Battle: Los Angeles" now!